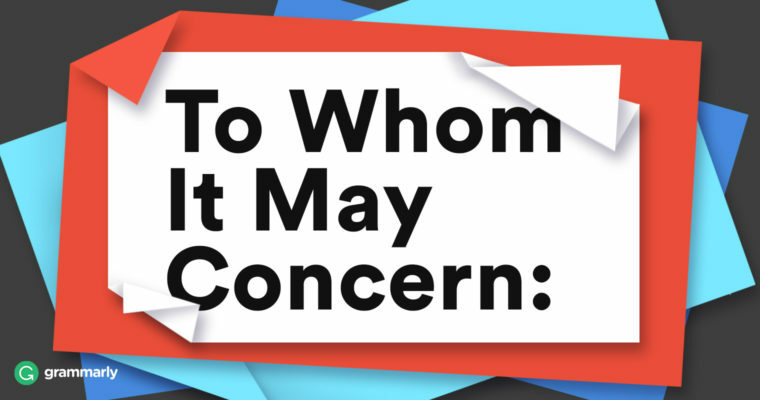 When to use "To Whom It May Concern"
Once, in a time before nearly everyone had access to the Internet in the palms of their hands, it was common to begin business correspondence with the salutation To Whom It May Concern. But times have changed. We’ll take a look at whether you should use To Whom It May Concern, explore a few alternatives, and talk about the only type of correspondence where this greeting is still acceptable. Should you use To Whom It May Concern? We can’t think of many good reasons to use To Whom It May Concern in an email or letter. But there are a few compelling reasons not to. For starters, the phrase is old-fashioned and stuffy. (If you concentrate, you can almost hear it spoken in an affected posh accent, can’t you?) It’s a remnant from a time when business correspondence had a much more formal tone. These days, however, we aim for a natural, conversational style. In some correspondence, To Whom It May Concern might even imply a degree of laziness on the sender’s part. Be honest—do you really not know who your email or letter concerns, or is it more that you can’t be bothered to find out? Be careful that To Whom It May Concern doesn’t show a lack of concern on your part. Here’s a tip: The same guidelines apply to another formal generic greeting—Dear Sir/Madam. It’s equally stuffy and glaringly non-specific. You can do better! You can almost always find another salutation. Let’s look at a few options. You’re savvy. You have the entire Internet (including LinkedIn) at your fingertips. If you know you’re writing directly to someone (a hiring manager, for example), do your homework and search out the relevant person. Yes, your letter may be passed along to other people, but those people will see that you cared enough to find the right person to address in the first place. Here’s a tip: Rapportive, a Gmail add-on, will help you find the LinkedIn account associated with an email address. Use it when you have a contact email address but no contact name. Sometimes, researching a contact name isn’t the best use of your time. A hiring manager, for example, doesn’t spend more than a few minutes looking at a resume, so the fact that your cover letter lacks personalization is probably not going to register as a red flag. At least you addressed the right department. Spend your time writing an amazing cover letter instead. If you’re not reaching out to an individual, or if your message could be seen by a number of people, you can’t go wrong with a simple hello. Keep in mind that Hello and Greetings are slightly more casual than the other options we’ve listed, so they may not be the best option for things like cover letters or other formal business correspondence. When is it okay to use To Whom It May Concern? Let’s say you’re writing a letter of recommendation for a colleague. He’s going to be making multiple copies to hand out at interviews, and those letters are meant to be seen by anyone interested in hiring him. In this case, because the correspondence is generally considered formal, and because there’s no single specific addressee or department, To Whom It May Concern works. Here’s a tip: Always format “To Whom It May Concern” with a capital letter at the beginning of each word. Follow it with a colon. Double-space before you begin the body of your letter. I’m writing to file a complaint about the service I received during my November 15 visit to your store. In most cases, though, try to narrow your focus rather than cast a broad net. Ask yourself “Who does this email concern?” If you can honestly answer “Anyone,” then feel free to use To Whom It May Concern. But if you can home in, whether on an individual (Mr. Smith) or a department (Admissions Department), always use the more specific approach.